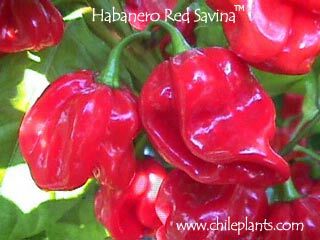 All photos Copyright © Cross Country Nurseries HABANERO RED SAVINA® - extremely hot; Habanero; 1.5 to 2.5 inches long by 1 to 1.5 inches wide; medium thick flesh; matures from green to red; pendant pods; green leaves; 24 to 30 inches tall; Very Late Season (90+ days); from USA- California; **Cross Country Nurseries is a licensed grower of the Red Savina® Habanero (PVP 9200255). Transplants are provided for the home gardener. Seeds from these peppers can not be legally saved to sell to others. You must plan to use these peppers for your own use. ; 6-8 pods per half-pint; C.chinense. 20 seeds.